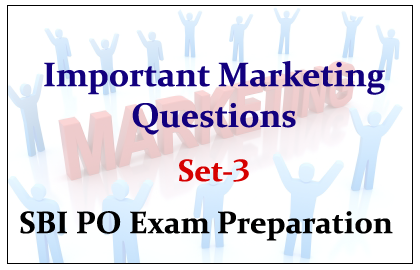 List of Important Marketing Questions for the SBI PO Exam were given below. Candidates those who are preparing for those exams can use these questions to score more marks. 1).Who is the target group for a car loan? 2).Which of the following includes in the standard marketing practices? 3).In today’s changing banking scenario, aggressive promotion of business is necessary where the competition exists on ________. 4).Which among the following products, by way of an instrument of payment, are called plastic money? 6).In marketing terms, attitude can best be defined as _______. 7).In a selling process in today’s world________. 8).Among the following which statement is TRUE? a) Marketing involves additional work. b) Marketing is a waste of the emloyees’ time. c) Marketing is not required in India due to its vast population. d) Marketing involves team work. 9).A person who ultimately determines any part or whole of the buying decision is called______. 10).A package which has a secondary usefulness after its contents have been consumed is called _______.